Venetian harpsichords are characterised by the long scales intended for iron wire (typically 232 mm - 268 mm at f², equivalent to 309 mm - 357 mm at c²) and the use of cypress for cases, soundboards, and bridges. This gives the brilliance of iron strings tempered with the sweeter sound obtainable from cypress soundboards and this combination was virtually unique to Venice. Even today this type of instrument is still largely unknown since the specifications of these early instruments are unsuited to the general purpose role which a harpsichord often has to fulfill nowadays. The intended pitch of these instruments is still the subject of research. See Pitch for further discussion. The unravelling of the alterations made to 16th-century instruments, a detective-like study started principally by John Barnes, has shown that virtually all of the Venetian harpsichords have been altered from their original state to render them more useful to later music. Thus, the original C/E-f³ compass, usually with 1 x 8' and 1 x 4', was modified often to GG/BB-c³ and to give 2 x 8'. It seems that we should conceive of the 4' stop in such instruments as a separate register, akin to the 15th-century harpsichords which were only made at 4' pitch. As a result of the scaling, the tone of such 4' stops is better suited as an independent voice than to blend with the 8'. The word "gravicembalo" (which seems to be of late 15th-century origin) appears to herald in the "descent" of such instruments to the 8' pitch level. Many harpsichords have only a single 8' register and 2 x 8' is a rare disposition in 16th-century Venice, the first datable occurrence being c.1545 (W265 in my catalogue; the instrument for the Duke of Ferrara is unsigned, but may have been made by Alessandro Trasuntino). 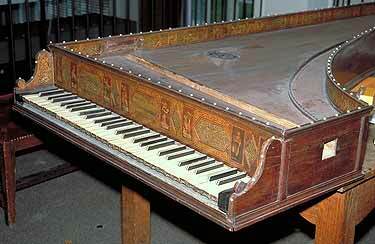 The earliest dated harpsichord, by Dominicus Pisaurensis (Domenico da Pesaro), was made in 1570. Venetian harpsichords are almost all of very high quality and they represent the major part of the evidence of Italian harpsichord making in the 16th century. Makers such as Trasuntino, Domenico da Pesaro, Baffo, and Celestini produced some of the most accurately and elegantly made instruments in Italy. This instrument uses the typical 16th-century Venetian disposition with 8' and 4' and has the common compass of C/E-f³. Strung in iron wire it can be made at either tuono corista = 415 Hz, tutto punto = 440 Hz, or at mezzo punto = 465 Hz. (See Pitch for further explanation of these designations). Based on my analysis of Venetian practice, some workshops offered an identical "model" of harpsichord, possibly as a result of the workshop tradition being transmitted by apprentices. Those made by the Trasuntino workshop and Franciscus Bonafinis (Bonafinis' harpsichord is signed "Alexander Bortolotti MDLXXXV", Musée Instrumental, Conservatoire Royale, Brussels) use the same design, which is the basis of my instrument. The registers are changed by means of the stop knobs projecting through the cheek. An outer case can be ordered with this inner instrument. 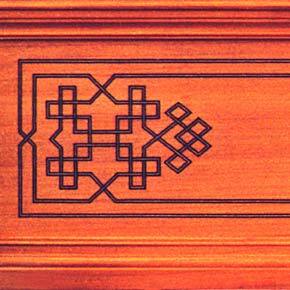 Decorative elements executed in intarsia inlay were used on the more lavish Venetian instruments, such as this nameboard, which I based on W265 (mentioned above). Made after the 1570 Dominicus Pisaurensis harpsichord, this is one of the earliest examples of a harpsichord with two 8' registers and offers the opportunity of a more powerful 8' tone. The original is at a pitch of mezzo punto = 465 Hz. 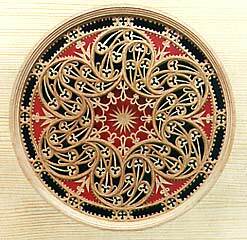 VENETIAN ROSES were typically made of cypress veneer in order to match the cypress soundboard; the veneer was about 0.20 mm thick reinforced on the underside with 0.1 mm of parchment. Several layers were worked to give the required impression of depth. This example I made follows a style used by Trasuntino, Baffo and Celestini. For information at this website on making these roses click here. This harpsichord is intended to provide an instrument in the Venetian tradition suitable for the modern player who has to accommodate different pitches. It is improbable that a Venetian maker would have chosen this compass, but it fits our modern needs when interpreting older styles. Thus the tuono corista= 415 Hz, tutto punto= 440 Hz, and mezzo punto= 465 Hz pitches have all been provided in a transposing arrangement. The basis of this harpsichord is the 1570 Dominicus Pisaurensis harpsichord. No Venetian harpsichord is presently known which was originally provided with a compass reaching to GG. However, the 1579 Baffo had a compass apparently C/E-c4, but was made at a lower pitch, alla quarta bassa, i.e. a fourth lower. Thus, the effective compass of the instrument was GG-g³ at 465 Hz and one could make such a compass nowadays and remain within the bounds of historical practice. The original disposition was 1 x 8', + 1 x 4'. A view of the 1579 Baffo (Musée de la Musique, Paris) harpsichord showing its decorated nameboard and the then exotic mahogany casework. Cypress was not the only timber used in Venice; a few precious instruments have ebony cases. The present compass is AA-f³, but was made from the original keylevers, all of which have (surprisingly!) survived through two alterations.